Um, yea +1 to this. I actually just started creating a back-end to check for this in my games only to realize I can't check rewards purchases. I really wanted to offer in-game reward access instead of forcing players to download a .txt file and copy/paste the secret key into the game for verification. Since launching on Steam last month, I wanted to update everyone here on the progress and what to expect moving forward. I also want to address a few things that seems to have been confusing people. First off, if you've purchased (NOT a free promo key) the game here on itch.io or backed the game on Kickstarter (CHECK YOUR PLEDGE TIER) you are eligible to claim a Steam key. Please refer to the itch.io FAQ on how to do this. I will still be available to answer questions specifically about things related to the itch.io platform, just know that I am one person on this project trying to stay on top of about 4 separate forums across several storefronts. Please be patient if I do not respond immediately, thanks. I of course will be making regular updates to the builds here on itch and other storefronts. Also, I just realized I may have setup privileges incorrectly on certain itch forum threads and have fixed them. They should be loading now for everyone. 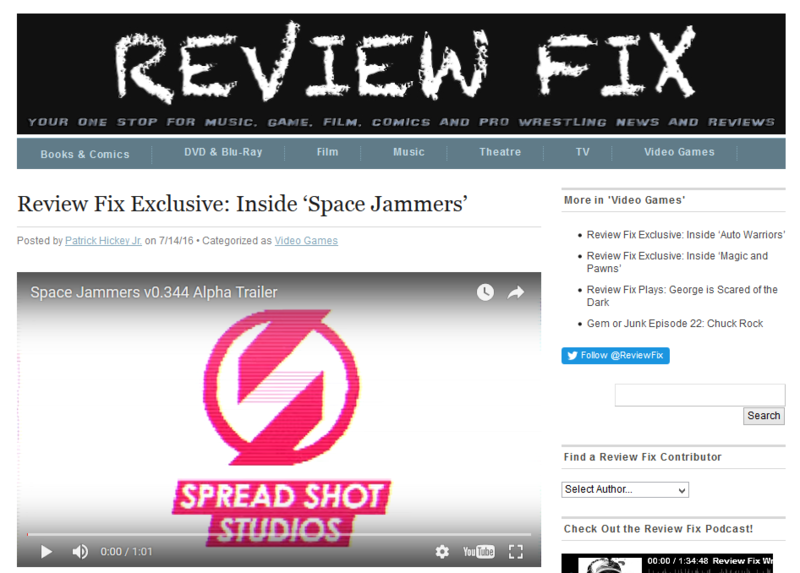 Space Jammers community » General Discussion · Posted in Steam keys? I've resolved the issue with the Mac build crashing. And since I've signed the app you shouldn't get any warnings from Gatekeeper (besides those that tell you that you downloaded from the internet, but you knew that already). If you download the new version (v0.436) the game should now startup fine. Let me know if there are other issues here and report any bugs! Thank you all for your patience! I wanted to let everyone know that I'm aware now of an issue opening the Mac build. There seems to be a bug with the latest version of the game engine I use and how it signs Mac applications. I can roll back to a previous engine version and export the build but that will introduce some bugs. But now that the game has started selling I can afford to pay for an Apple Developer account and properly sign Mac apps the way Apple likes it which means I can use the most current version of the engine. However setting up the paperwork for the Apple Developer account will take a few days so I will ask for your patience in getting this handled. Doing this will ensure the game will work the same way on all platforms going forward. Again, I apologize to those who just purchased the game for Mac. I am making this my first priority and will be uploading a new build ASAP. Thanks. Added Mac OSX build. Download it now! NEW Online Leaderboard. See your current rank and see when you are about to overtake another player on the score board. Friendly bot AI code has been greatly improved and may be implemented in normal gameplay next update. Greatly improved performance. Framerates are stable now. Itch.io provides download links which are the same thing as keys (like on Steam). These require an itch.io account if you do not have one already (so that these keys can be made available to you alone). That download code is unique to your email and can only be used by you once claimed. I believe once you download something, you've "activated the key" and it should then be associated with your account. As for Steam keys, for Kickstarter backers, I will definitely be providing Steam keys once they become available (sometime in March). I haven't yet decided if they will be made available for non backers. Also, I am working on the Mac build as well, it just requires more Q/A on my end, but it will be made available soon at no extra cost. I will make announcements as each of these things become available in the future. Thanks for the questions everyone, keep em coming! Game now runs at 60fps! New graphics for all bosses! Save Game data is flushed if current build version does not match the save file's. The first level tells you the controls on the computer screens popping up. Have you read those? Sounds like you are having graphics/video card issues. Have you tried disabling some of the effects in the graphics options menu? Sometimes users don't have up to date redistributables (if at all) which may reduce graphics compatibility. I had this issue on my laptop until I updated my drivers. I have about a 7 year old Mac I test on which is able to handle the graphics so I know it should not be a hardware issue. Without knowing your exact specs I can't infer much beyond this. I'll try a soak test on my Mac and see how it handles it. Have you been having any issues with the Mac build? If there is something I can fix I will look into it. Well if the game appears to slow down that's because the game literally slows down time when you are near bullets which gives players some extra time to dodge, bullet time. I can't speak to the jittery behavior, I've mostly seen pretty stable framerates. But I do get this questions occasionally when people think the game is slow or glitching...that's all intentional as part of the art style and a partial throwback to how SHMUPS used to behave when a lot of bullets were on screen at once. Try it again, and take notice of when the screen goes black and white, that's when bullet time is in effect. Were you getting low fps? How do you mean? The Kickstarter is now officially LIVE! Back it here to get Early Bird prices or the ability to be involved in the creation of content for the game, digital SWAG for your phone/desktop or forum avatar!!! Just FYI, this latest version fixes a problem for those with multi-monitor setups where they were able to click outside the game. Cursor is now locked to one monitor. OH thanks so much Amos, you rock! I always get those icons confused since I'm not much of a Linux/Mac user. Ok, I didn't realize it was hard to read. I wish there was an option to change the font size that would help readability. Maybe I'll change the font. Thanks I'm glad you like the art! It's difficult now for me to make screenshots of the characters now since I've made them all procedurally generated. But I will be offering little sprites from the game for use as forum avatars, desktop icons, etc as Kickstarter rewards later this month. Are you saying the font on the itch page is hard to read or the in-game font? Assuming this is like version 0.375 or something, this may be fixed in the preview build. I have redone that menu to play nicer with the mouse. I haven't heard of this bug before but it sounds like it's getting input from something because the mouse always takes control if it hovers over one of the fields. Yep, Mac build is available now and it'll continue to be updated at least until the game goes on sale (which will be after the Kickstarter wraps up sometime in October). After that, I'll need to see if YoYo games fixes certain issues with GameMakers Mac exporter. I don't want to get into a situation during development where I'm unable to support/fix certain issues for paying Mac users due to game engine incompatibilities beyond my control. Hope that makes sense. I'm glad you like the game! I do, it will be part of a stretch goal for the upcoming Kickstarter as I will need to bring on another programmer to help implement Online Multiplayer while I finish up the rest of the game. Being the only developer on this project (I currently do the Art/Design/Programming/Marketing myself), trying to implement Online MP would drastically push back the release which I don't think anyone wants. But if enough people show their support and interest in the game then I can get Online MP in for the release. This one includes lots of new effects and optimizations to old effects so the game should run even smoother. Two player skills have also been modified and the level lighting has again been evened out. Update 0.355 is now LIVE! Get it now! - Mouse controls have been GREATLY improved. Much smoother camera movement now. Cursor can also move anywhere on screen instead of being limited to a radius around the player. - Added gamepad vibration when hit. - When playing co-op, each player can drop out from the pause menu. 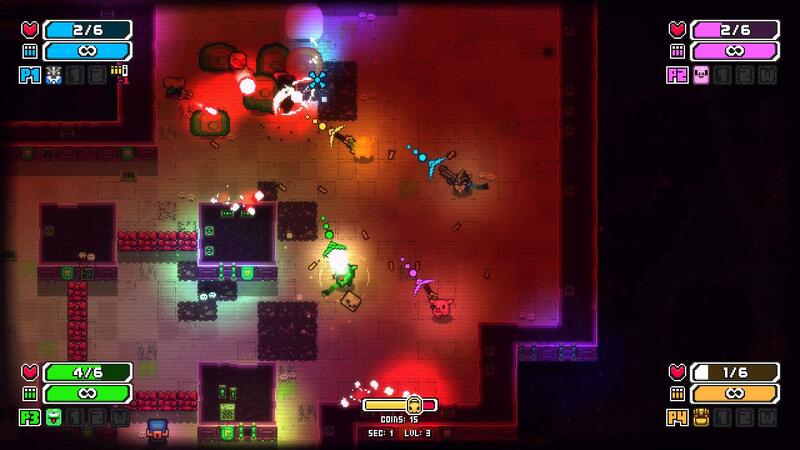 - Minor improvements to lasers and effects. 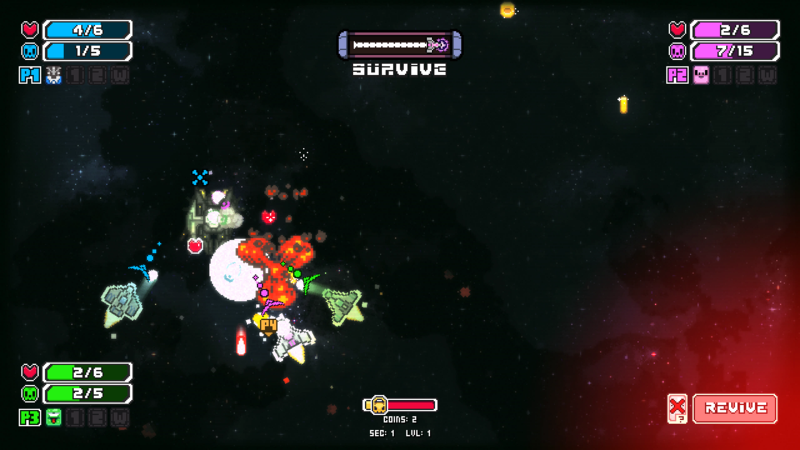 - Added flashing heart above player head to indicate low health. - Changes to level generation so lighting is not too overblown. 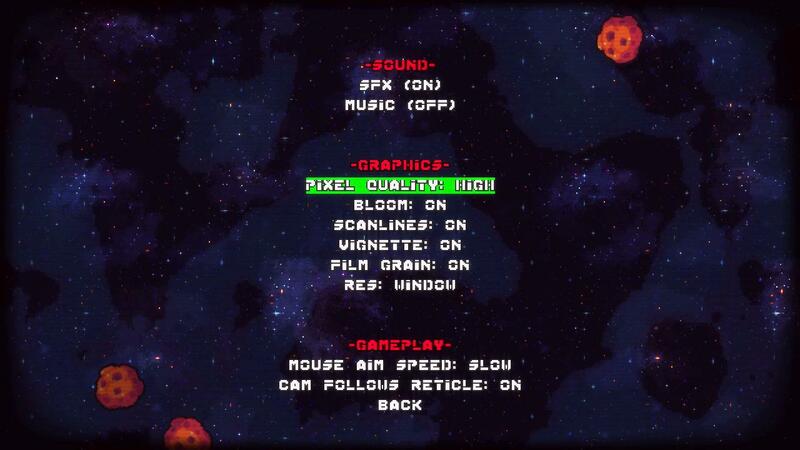 - Each levels' random ruleset is displayed at the top of the screen. - Players will no longer collide with each other. - Removed flicker from CRT shader. Are you running the latest version (0.351)? I have been having issues with the Mac version. I get very unpredictable results when running the game on Mac as opposed to every other platform, not sure why, but it could just be that Macs aren't or haven't historically been built for gaming. I am considering dropping support for Mac in the future, at least until the game is finished. Ps3/4, Xbox gamepads should work with Linux. I can't confirm about Logitech since I don't have one. Please note, no other gamepads other than Xbox or PS3/4 are supported by Mac OSX. v0.351 is Live! Come and get it! Should be more stable experience if you were previously running into game stopping bugs. Check out the new options menu for configuring graphics and gameplay settings. Please leave comments if you run into any issues and I will do my best to fix them. Enjoy! Currently only Xbox controllers are supported. I am having issues getting support for PS3, Logitech and other generic controllers but I am looking into it. Space Jammers is on Square Enix Collective! 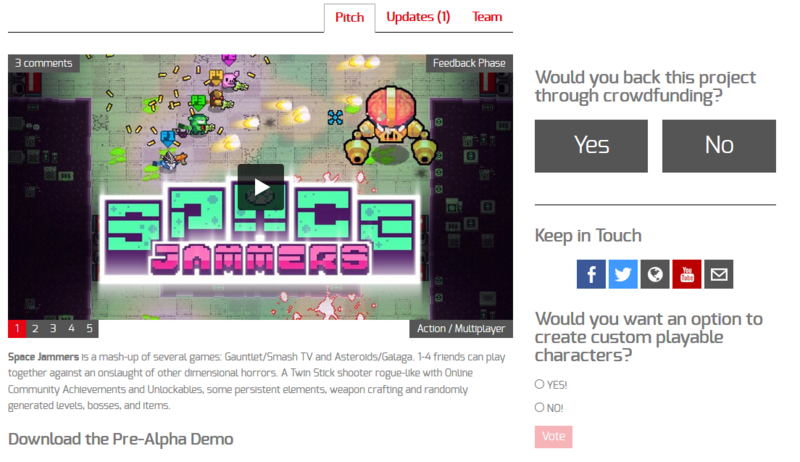 Vote YES for Space Jammers! A few weeks ago I was granted a slot on Square Enix's Publishing site known as the Square Enix Collective. This site is a way of proving out the interest in games before they go on to crowd funding sites like IndieGoGo and Kickstarter. The first phase involves voting for whether you would back a game in the future. After this phase ends Square Enix will make a decision whether to help with marketing and exposure when the crowd funding campaign goes live. If crowdfunding goes very well they will even offer to publish the released game for me which means the game can reach more platforms and be more stable. It will only take a few minutes and you may even find some other interesting games there! Thank you all! Where is the game at currently? First interview published this week! The v0.351 update coming out tomorrow will fix various bugs as well as adding a slew of graphics options for customizing performance on low end computers. Some options (like pixel quality) will help speed up performance especially on laptops when turned to Low. Other options are more aesthetic and can be disabled altogether for those who aren't fans of CRT effects or vignetting. I have just brought the project over to the newest version of GameMaker: Studio which is the engine I employ. This had to be done eventually but has the unfortunate consequence of creating new bugs out of previously working code. The next month I will greatly depend on everyone to post error messages either here in the comments or on Twitter (remember to mention @SpreadShotDev so I am notified). Many of you have already been doing this and I just want to take this opportunity and thank those of you leaving comments with screenshots of errors, listing your OS specs and thoughts on what you like/dislike. I read every comment even though I may not respond to each one. So again, THANK YOU! I am thinking of ways to reward those of you who consistently help in this effort so keep it up! I am currently working towards creating a stable build for all 3 major platforms (Windows, Mac, Linux) in preparation for the Kickstarter. The next few updates will be geared towards fixing game stopping bugs and performance issues on Low spec computers. Once a stable build has been out I will enter production and start designing new levels, enemies and weapons. After at least 3 levels have been built out I will switch the game over to a PAID ALPHA which you will be able to purchase separately from the current demo build. The demo will then be removed altogether as I will be unable to update 2 different builds for the duration of development. If you buy the game from itch.io or GameJolt you will be given a Steam key, however it may be some time before the game will be made available on Steam until it is at a quality level in line with that platform. Oh ok, so the last portion of the level loading just takes a while on Low spec machines. It looks like the game has frozen but it hasn't you just need to keep waiting for it to load. The newer version loads faster but it will still appear that the game has frozen. Since you are running on a lower spec hardware and they just don't load as fast as mid-high end PC's. Just be patient and it'll finish. Keep in mind the game is still heavily in development and the code won't be optimized until its near completion. 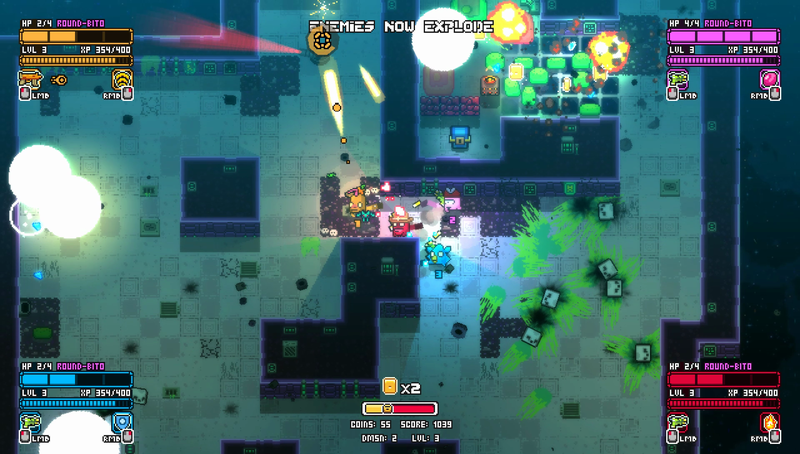 By the way, how long on average does Nuclear Throne levels take to load on your computer? When I played their first Early Access release I noticed their levels loaded pretty slow for me. Ok, so after a few minutes of googling, it looks like a lot of games have problems with the Intel HD 4000 series graphics chips for the reasons I listed above. Since this is a problem with Intel hardware and not the Gamemaker Studio engine, there isn't much I can do. My recommendation would be to play the game on a computer with a discreet graphics card. Thank you for bringing this to my attention, this helps me create a recommended minimum hardware spec for the game so folks know whether they can run the game. I apologize there isn't much I can do but like I said, a new update tomorrow will allow you to turn off graphics settings, so try that. The game levels load 10x faster in v0.350 (about 3-5 seconds depending on cpu speed). I'm not aware of any problems with switching weapons that causes the compute to freeze. Does it give you any error messages when it freezes? If so can you post here what it says, that would help me greatly. Before anything else, please make sure you have the latest drivers for your graphics chip direct from Intel (don't download from 3rd parties). Now since you are running an Intel Hd graphics 4000, that means it is an integrated graphics (on the CPU chip) and is not a discreet graphics card. This is a rather low end graphics chip, I would not be surprised that you are having problems since integrated graphics cards do not have good performance for playing games. I'll need to hunt down some minimum specs for integrated graphics cards, but off the top of my head, I believe this is your chief problem when running the game. I will be releasing a new update tomorrow which will give you the option for turning off a slew of graphics options so you can try turning off everything and seeing if that helps. From testing, I have found a huge performance boost on my low end laptop when turning off/down certain settings. If the game consistently crashes your computer every time you open it, then yea something is wrong with the game, but this is the first time out of thousands of plays that anyone has mentioned a crash. But it would help me out a lot to know if that is the case so I can fix whatever the cause is.